City of Yawnghwe in the Inle Lake, Myanmar. 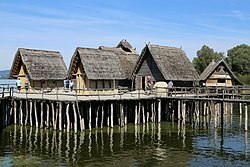 Reconstruction of Bronze Age German stilt houses on Lake Constance, Pfahlbaumuseum Unteruhldingen, Germany. 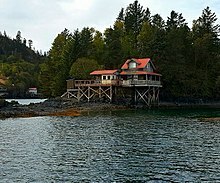 Many of the buildings in Halibut Cove, Alaska, are stilt houses. 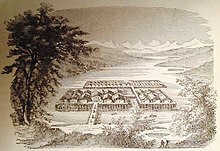 Herodotus has described in his Histories the dwellings of the "lake-dwellers" in Paeonia and how those were constructed. Summer family dwellings of the natives of the Kamchatka Peninsula (Russia) called Itelmens or Kamchadals. Their winter dwellings were earth-sheltered and communal. Stilt houses are also common in the western hemisphere, and are an example of multiple discovery. They were built by Amerindians in pre-Columbian times. Palafitos are especially widespread along the banks of the tropical river valleys of South America, notably the Amazon and Orinoco river systems. Stilt houses were such a prevalent feature along the shores of Lake Maracaibo that Amerigo Vespucci was inspired to name the region "Venezuela" (little Venice). As the costs of hurricane damage increase, more and more houses along the Gulf Coast are being built as or converted to stilt houses. Diaojiaolou – Stilt houses in southern China. Heliotrope – A concept house designed by Rolf Disch with a single stilt, optimized for harnessing solar power. Kelong – Built primarily for fishing, but often doubling up as offshore dwellings in the following countries: Philippines, Malaysia, Indonesia and Singapore. Bahay Kubo – The traditional house type prevalent in the Philippines. Palafito – Found throughout South America since Pre-Columbian times. 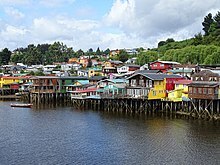 In the late 19th century, numerous palafitos were built in Chilean cities such as Castro, Chonchi, and other towns in the Chiloé Archipelago, and are now considered a typical element of Chilotan architecture. Pang uk – A special kind of house found in Tai O, Lantau, Hong Kong, mainly built by Tankas. Papua New Guinea stilt house – A kind of stilt house constructed by Motuans, commonly found in the southern coastal area of PNG. Queenslander – Stilt house common in Queensland and northern New South Wales, Australia. Sang Ghar - A type of stilt house built in Assam state of India. It is mainly found in flood-prone areas of the Brahmaputra river valley. Thai stilt house – A kind of house often built on freshwater, e.g., a lotus pond. Vietnamese stilt house – Similar to the Thai ones, except having a front door with a smaller height for religious reasons. The Wooden House in Woloan - Tomohon City in North Sulawesi. Commonly known as Stilt House of Woloan. ^ David M. Bush (June 2004). Living with Florida's Atlantic beaches: coastal hazards from Amelia Island to Key West. Duke University Press. pp. 263–264. ISBN 978-0-8223-3289-3. Retrieved 27 March 2011. ^ Our Experts. Our Living World 5. Ratna Sagar. p. 63. ISBN 978-81-8332-295-9. Retrieved 27 March 2011. ^ Francesco Menotti (2004). Living on the lake in prehistoric Europe: 150 years of lake-dwelling research. Psychology Press. pp. 22–25. ISBN 978-0-415-31720-7. Retrieved 29 March 2011. ^ Paul Rainbird (14 June 2004). The archaeology of Micronesia. Cambridge University Press. pp. 92–98. ISBN 978-0-521-65630-6. Retrieved 27 March 2011. ^ Dindy Robinson (15 August 1996). World cultures through art activities. Libraries Unlimited. pp. 64–65. ISBN 978-1-56308-271-9. Retrieved 27 March 2011. ^ "Fortified Home Design Pioneered on the Texas Gulf Coast". Texasgulfcoastonline.com. Retrieved 2012-08-01. ^ "Sejarah Industri Rumah Kayu Woloan | Tumou Pratama". Rumah Kayu (in Indonesian). Retrieved 2018-05-08. Ernest Ingersoll (1920). "Lake Dwellings" . Encyclopedia Americana.